A Yellowstone earthquake today 2014 struck Montana. A Yellowstone earthquake today March 30, 2014 was the strongest to strike since 1980. Officials are now asking local residents for assistance with the matter. Officials report that a 4.8 magnitude Yellowstone earthquake struck just after 8:15 am MDT today. The quake was shallow. It started twenty-three miles east of West Yellowstone and sixty-five miles southwest of Bozeman. It was eighty-six miles northeast of Rexburg, Idaho as well. Responses to "Yellowstone Hit By Strongest Earthquake In 29 Years (Video)"
OMG. I feel for these creatures they don't know what is happening. It's so sad. It's just a matter of when the BIG one happens. Same video was posted on March 20, with expectation that a major earth event such as volcano or quake would occur in next few days. Look at the shadows, the bison have them but the stakes and bushes on the side of the road do not. I find this video clip has some post processing to it. 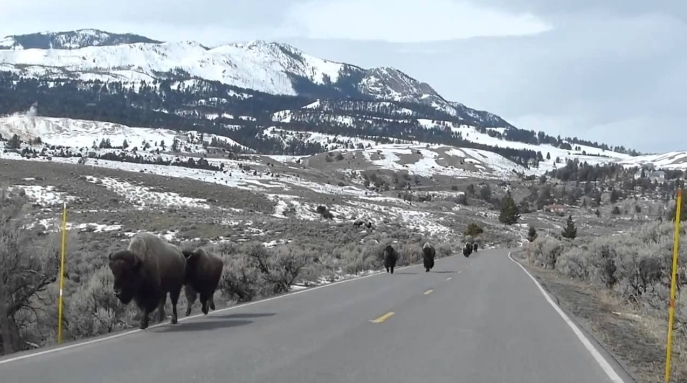 Interesting that the bison have leaned to use the right lane of the road.. Think that we humans have not had much impact on the wildlife there? As to them running from the earth quake.... While they were running, it was not a panicked, Full out, 'running for their lives" kind of thing like the caption states. Just the news guys putting together footage to better gain viewers/ readers. First thing that came to my mind was, them bison know which side of the the road to keep to, and no panick??????? Good thing man destroyed the environment with nice paved road for them to escape on! Quake? or Wolves? or Man made triggering them?